Turmeric is notoriously difficult for the body to absorb and it is also a challenge to get the minimum recommendation of 1 gram per day in our diet. Turmeric BCM-95 is a patented form of whole turmeric that helps to address this issue by providing a trademarked formula with 700-900% better absorption in human clinical trials. In addition, it doesn’t require black pepper to be absorbed which can be a sensitivity for some patients. We added medium chain triglycerides (MCT) to Dr. Wanda’s Wellness – Turmeric Boost which is a fat that encourages absorption as well. Once again, no fillers, no wheat, no gluten, no diary – just value, quality and effectiveness. 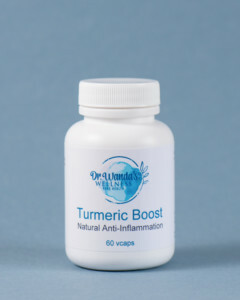 Click here for more important information about Dr. Wanda’s Turmeric Boost! Want to see a sample of the research that went into choosing Dr. Wanda’s Turmeric Boost? Click here for the Research Library for this supplement.